Extending deep into the heart of the continent, Lakes Ontario and Erie were of great strategic importance. Control of these waters made it possible to supply remote outposts and keep armies on the march in the highly contested West. The competition for control of Lake Ontario was especially vigorous with each side trying to outgun the other by building ever larger warships. 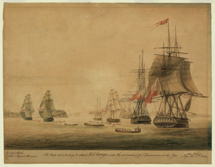 Ironically, the U.S. and British fleets on Lake Ontario never met one another in an all out fleet action since both sides understood full well that the stakes in such a battle would be much too high. The loser would very likely lose, not just a battle, but the war itself. A plaque in Coronation Square off Remembrance Drive marks the area where American troops landed during their second raid on York in July, 1813. The Americans burned a military barracks and storehouses near here and took what provisions they could find. A simple historical plaque describes the attack. To protect the Royal Navy Yard at Kingston and guard the vital trade and communication routes along the St. Lawrence River, the British built Fort Henry on a point of land opposite Point Frederick. Gun emplacements here helped keep American warships at a safe distance. The grand fortifications seen here today do not date from the War of 1812, but rather from the 1830s. Now a popular living history museum, Fort Henry National Historic Site informs and entertains visitors with martial parades and music, guided tours, and museum exhibits. Fort Henry is located on County Road 2 just to the east of downtown Kingston. From Highway 401 take County Road 15 and County Road 2 to the fort. Built, destroyed, and rebuilt repeatedly during the French and Indian War and the Revolutionary War, the Fort Ontario was destroyed once again in 1814—this time by the British who had established it in the first place. Fewer than 500 men defended the fort in May of that year when a large flotilla of British ships suddenly appeared and put ashore nearly 1,000 troops. The garrison was soon overwhelmed, and the British managed to haul away a large quantity of supplies before burning the fort. Rebuilt once again in 1840s, the old fort is now a New York State Historical Site. Fort Ontario Park is located east of the Oswego River along the Oswego lakeshore. Point Frederick is a spit of land forming the western banks of Navy Bay, and it is located directly across from Fort Henry. The earthen fortifications here surround a Martello tower. The point and its fortress is now part of the Royal Military College, which dates to the 1870s. Also on the college grounds is the Stone Frigate where the dismantled parts of British warships were long stored. The Royal Military College is located off Highway 2 just to the east of downtown Kingston.